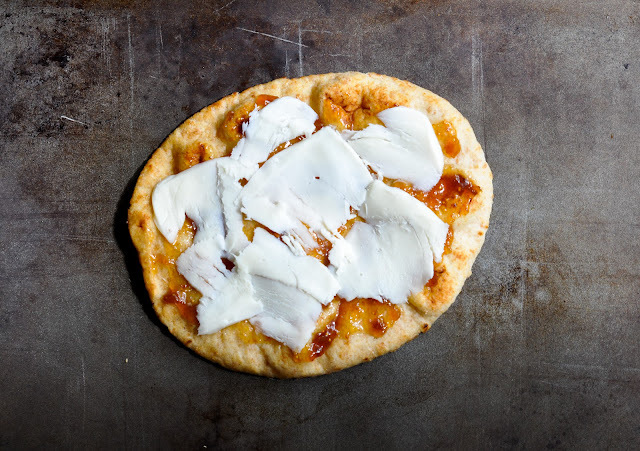 What we have learned from my what I ate last week posts is that I love using whole-wheat naan bread as a base for mini lunchtime pizzas, and that I love my fig jam. Fig jam is incredibly thick, rich, and sweet, and pairs really well with nuts, cheese, crackers, and fruit. I love pairing it with almond or walnut butter for a scrumptious PB&J. Below is a picture of the fig jam I love so much. Naan bread is awesome because you can do so much with it. You can heat it up with just a splash of olive oil and pair it with your favorite salad, or use it as a base for a mini pizza like I did above. I love to play around, and throw different toppings on the naan bread to see what I can create. It’s a bit like painting and very therapeutic. I threw this one together on a whim one day as I was craving some fig jam, and noticed that I didn’t have any bread in the house (which was very odd). I thought, “Why not throw it on the naan bread and heat it up?” Needless to say, I loved the end result of this creation, and if you like fig jam, you will as well. Preheat oven to 425 degrees. Put a slice of naan bread on a rimmed baking sheet. Brush the bread with a bit of olive oil, and then spread some fig jam on top. Next, add some thinly sliced mozzarella cheese. Fig jam and mozzarella go together like peanut butter and jelly. Pop it in the oven and bake for about 8-10 minutes, or until the cheese is melted and the crust is crispy and brown. Meanwhile, in a small bowl, toss together a handful of arugula with a splash of olive oil. 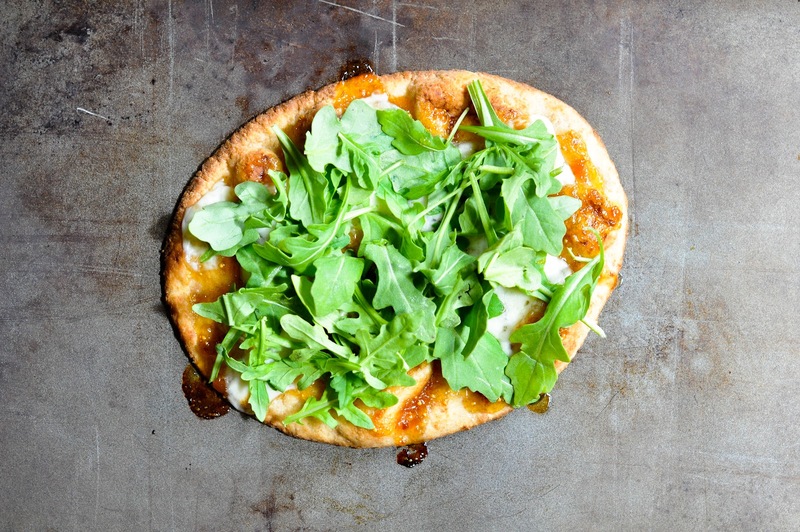 When the pizza is out of the oven, throw the arugula on top. Slice the pizza into 2 to 3 pieces and enjoy. This is a super easy pizza to throw together for lunch or light dinner. Come to think of it, I could even see this being a great appetizer. All you need to do is cut the naan bread into smaller pieces. 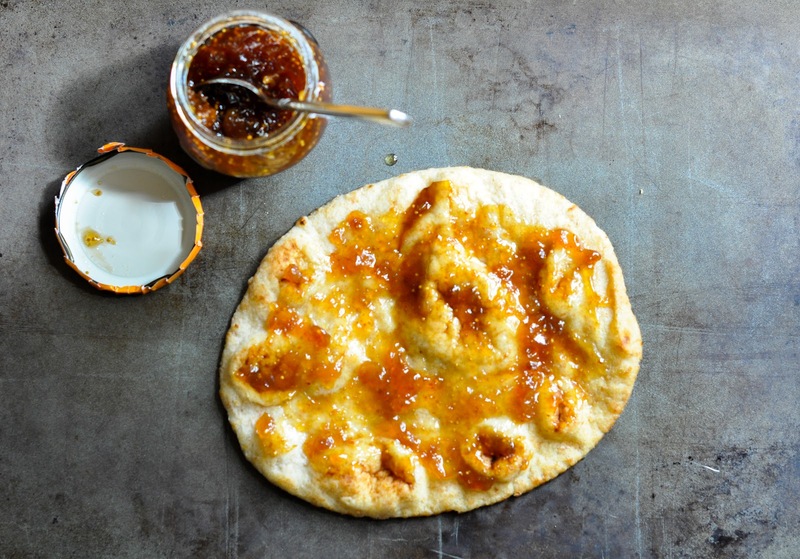 See, there is so much you can do with a little fig jam and some naan bread. Did I mention that figs are good for you? Looks great! Someone gave me a jar of fig jam in a basket gift, now I can use it! I know this would taste great, Jackie: figs and arugula are perfect together. I might dress the arugula in lemon juice rather than adding more oil. SO yummy!! Looks exactly like something you would get in a posh san fransiscan restaurant. And I love combining cheese and jam… had some pomegranete jam and cream cheese on sourdough for breakfast this AM.. heaven! Yummy! I like the sound of your breakfast Em. Need a break from my cereal rut! Oh gosh, every stage of that pizza looks amazing, especially that fig jam!